We are pleased to announce a new section of cycle path alongside the main road out of Hayling. Previously, this stretch was was restricted to members of the Registered (Horse) Riders Scheme but the landowners – Andrea and Simon Walter – have now given permission for cyclists to use it too. The old restrictive signs have been removed and we will be erecting temporary replacements soon. More permanent signs will follow. 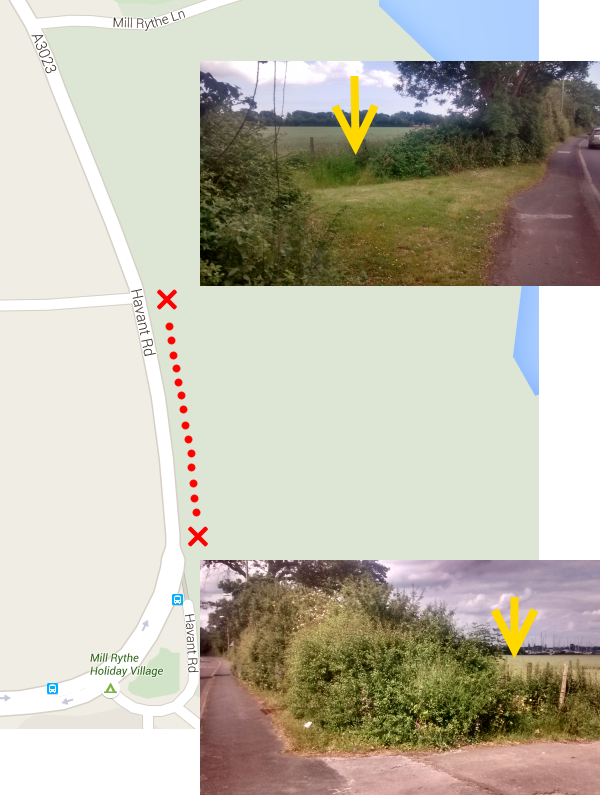 Note that the path continues north alongside the main road to Mill Rythe Lane – but this section is still restricted to the RRS. Cyclists do not have permission to use it. The new cycle path adds a section to Hayling’s safe cycle routes to school network and we hope it will become part of a North-South route onto and off the island. Our thanks to Dave Mowatt who has led our discussion with the Walters. Unfortunately, some clearance work is needed before people can use the new path. The pictures above show it is overgrown at each end and there is a badly overgrown section in the middle. If you think you can help with clearance work, please get in touch. Great news! We’ll done to everyone involved.